Long and short term contract hire, business travel, school trips, holidays and more! On board TV systems, hot and cold drinks facilities, toilets, 3 point seatbelts, reclining seats, tinted windows and air conditioning! Latest EURO 6 Emission Coaches for a reliable and comfortable journey in the UK and across Europe. G.H. 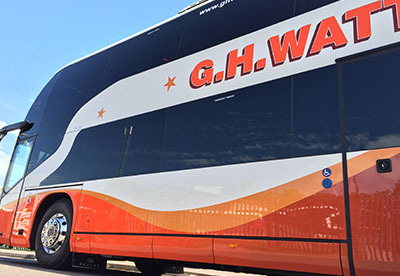 Watts have built a reputation as professionals in providing first class private coach travel for corporate clients from many business sectors. Our close attention to detail ensures every customer is provided with their exact requirements and our passion for providing great service comes before anything else. 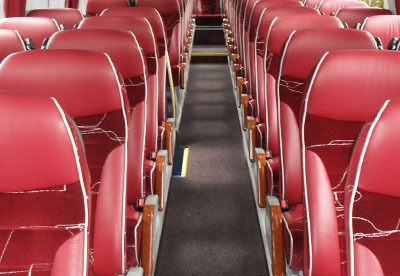 Our team of highly trained, professional and uniformed coach drivers, on board TV systems, hot and cold drinks facilities, toilets, 3 point seatbelts, reclining seats, tinted windows and air conditioning – we have the coach for all your journey requirements. When it comes to planning your trip we are completely flexible and will work to accommodate any needs including when it comes to collection and the end of your trip. We can also arrange to pick up and drop you off at locations of your choice for convenience and ease of access. Let our experienced travel team help you make the arrangements. They can give you advice on planning your requirements, routes and travelling times.